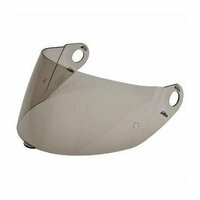 Smoked and mirror tinted shields are designed for daytime use only and are not recommended for nighttime use. The N104/N104 Evo/N104 Absolute helmet faceshields come in two sizes, depending on the shell size of the helmet you bought. Helmets sized XXS through Large have faceshields that are correspondingly sized XXS – Large, and helmets sized XL through XXXL require a faceshield of the same size, XL – XXXL. The drop down menu above clearly shows the two sizes offered for each color shield.